The Tuck School of Business, one of three professional schools of Dartmouth College, was founded in 1900 as the world's first graduate school of management. At the time, establishing a business school with the status of a graduate department was bold and unorthodox, but the wisdom of the plan has been validated during the past century. Our school served as the prototype for one of today’s most important educational formats: the graduate business school conferring the MBA degree. At the beginning of the 20th century, U.S. commerce and industry were experiencing explosive growth, and more college graduates were choosing careers in business. William Jewett Tucker, then president of Dartmouth College, was concerned about business leadership in a broad social sense and recognized the need for “training commensurate with the larger meaning of business.” Tucker thought of his former college roommate, Edward Tuck, who enthusiastically agreed to help. 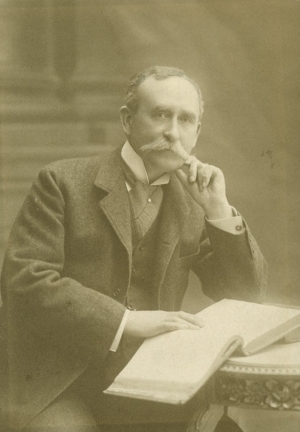 Edward Tuck (1842-1938) was an international financier and philanthropist who, after serving as U.S. vice consul in Paris, turned to international banking ventures and railroad investments as his father had. Through Tuck’s generous and visionary gifts the school was founded. Originally named Amos Tuck School of Administration and Finance in memory of Tuck's father, the school was renamed Amos Tuck School of Business Administration in 1941. Today it is uniformly known as the Tuck School of Business at Dartmouth. Dartmouth College, a member of the Ivy League, has been one of the world’s great educational institutions since its establishment in 1769. The college provides Tuck with a strong foundation on which to achieve its goal of offering the world’s best education preparation for a career of business leadership.